Rarely does a professor have a “blink” moment in class, a sudden revelation that seems completely obvious once it enters your consciousness. This happened to me last year in the museum’s galleries while teaching a seminar on appropriation for Case Western Reserve University’s art history majors. We were looking at the Flemish master Peter Paul Rubens’s immense painting Diana and Her Nymphs Departing for the Hunt, which hangs prominently on the far wall of gallery 212, and discussing its relationship to another nearly identical version in the J. Paul Getty Museum in Los Angeles. For a long time I had been perplexed by its main figure, Diana (Artemis in Greek), the goddess of the hunt, who is identifiable by the crescent moon on her forehead. She stares boldly out at the viewer, and is considerably larger than the nymphs that accompany her. Rubens’s version of this classical goddess is not the svelte, athletic, fetching girl that we are accustomed to seeing, but rather a fleshy (one might say Rubenesque), muscular, imposing woman. She holds a distinctive pose with her right leg thrust forward and her left arm akimbo behind her back. Her dangling right arm seems especially prominent, and I knew I recognized it from some other work of art. As I stared at the painting—while my students waited patiently—it suddenly dawned on me that Rubens had chosen a very unlikely model for his monumental Diana. Rubens’s Diana is none other than a transposed, and transgendered, copy of one of the most famous marble statues from classical antiquity, the Farnese Hercules. Now housed in the Naples Archaeological Museum, this colossal (over 10 feet tall) statue of the Greek hero resting after his labors was found in the Baths of Caracalla in Rome in 1547. Until 1787 it was on display in the Palazzo Farnese, hence its nickname. The statue was a favorite of Mannerist and Baroque-era artists visiting Rome, and drawings and prints depicting it are numerous; one of the best known is the Dutch artist Hendrick Goltzius’s engraving of 1589, The Great Hercules. 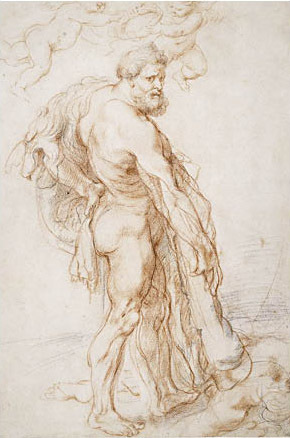 That Rubens studied this classical work, along with many others, during his 1601–8 sojourn in Rome is proved by his drawings. His enlivened version of the statue is beautifully rendered in a red chalk sketch in the British Museum’s collection. There was also a life-size plaster cast of the statue in Antwerp in the 17th century, and Rubens himself owned a small-scale replica. Besides the relaxed pose, the addition of the tiger skin to Diana’s garb recalls the ancient statue. Its head over her left shoulder, in particular, is reminiscent of Hercules’s lion. 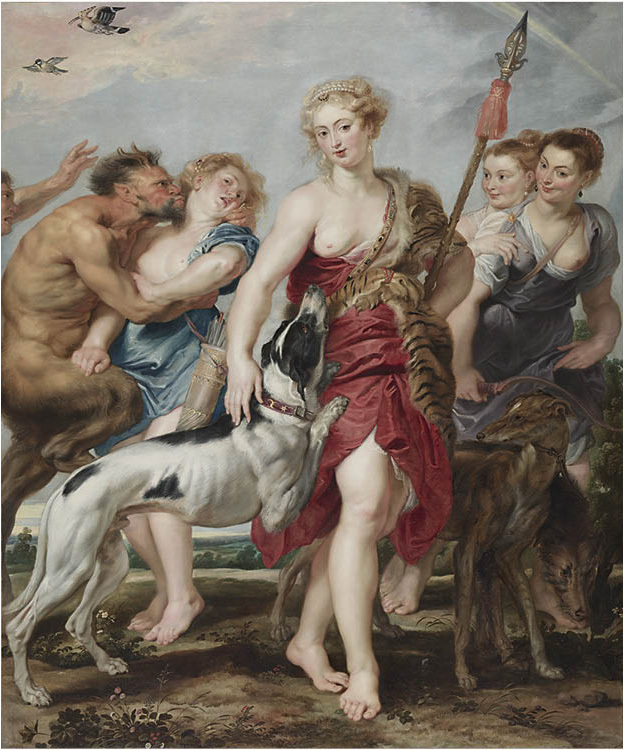 Rubens has also added hunting dogs and a backdrop of two couples. On the right are a pair of smiling nymphs, one of whom bears the features of the painter’s wife, Isabella Brant (as seen in the museum’s portrait of Brant hanging to the right of the painting in the gallery). A third nymph at the left is not so happy as she struggles to escape the amorous embrace of a randy Pan. One could speculate that in the contrast Rubens is deliberately recalling a famous myth of the youthful Hercules. While tending cattle on a mountain Hercules was visited by two allegorical figures, Vice and Virtue, who offered him respectively a luxurious or a difficult life. To his everlasting glory he chose the latter. The story was depicted in Italian Baroque painter Annibale Carracci’s well-known masterpiece executed for the ceiling of the Farnese Palace in 1596. Rubens surely knew this work as well as the story, and alluded to it in the background of our painting. By choosing the hero’s statue as the prototype for Diana, he may have been reminded of this heroic tale. The painting is dated circa 1615. A few years later Rubens composed another image of Diana with her nymphs, now in the Prado in Madrid. Known as the Diana Cazadora, she bears little resemblance to the Farnese Hercules, except for the left arm. Clearly Rubens rejected this earlier robust model and opted for a more appealing and lithesome goddess of the hunt. 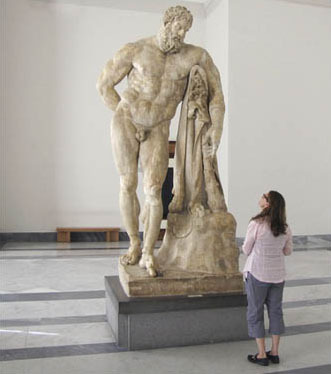 Artists’ fascination with ancient statues like the Farnese Hercules has not abated. In 2013 Jeff Koons made a life-size white plaster version of the famous statue to which he added a blue glass spherical garden ornament. Entitled Gazing Ball (Farnese Hercules), Koons’s appropriation is not nearly as subtle as that of Rubens, which went unnoticed until my blink moment. Haskell, Francis, and Nicholas Penny. Taste and the Antique: The Lure of Classical Sculpture 1500–1900. New Haven, CT: Yale University Press, 1981. Jaffé, Michael. Rubens and Italy. Ithaca, NY: Cornell University Press, 1977.